Pen-and-ink and wash drawing of a sculpture of Shiva receiving Ganges from the Ravana Phadi Cave at Aihole, by an Indian draftsman, dated 1853. The large sculpture panel of Shiva receiving the Ganges (Gangadhara Shiva-Murti) is situated in the hall of the Ravana Phadi Cave at Aihole which excavated at the end of the sixth century during the Chalukya period. 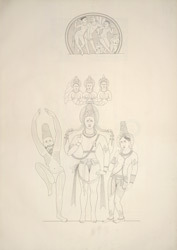 Shiva stands erect and is flanked by Parvati. On the right of Shiva is the skeletal Bhagiratha practising penance. Right on the top of Shiva high headdress are the three river goddess, Ganga, Yamuna and Sarasvati. Ganga, the most sacred river of Hinduism descends to earth through Shiva's matted lock at the behest of Bhagiratha.